True cherry fruits are born by members of the sub-genus Cerasus which is distinguished by having the flowers in small corymbs of several together (not singly, nor in racemes), and by having a smooth fruit with only a weak groove or none along one side. The subgenus is native to the temperate regions of the Northern Hemisphere, with two species in America, three in Europe, and the remainder in Asia. The majority of eating cherries are derived from either Prunus avium, the wild cherry (sometimes called the sweet cherry), or from Prunus cerasus, the sour cherry. This list contains many Prunus species that bear the common name cherry. For a complete list of these, see Prunus. Some common names listed here have historically been used for more than one species, e.g. "Rock cherry" is used as an alternative common name for both P. prostrata and P. mahaleb. The native range of the wild cherry extends through most of Europe, and the fruit has been consumed through its range since prehistoric times. A cultivated cherry is recorded as having been brought to Rome by Lucius Licinius Lucullus from northeastern Anatolia, also known as the Pontus region, in 72 BC. 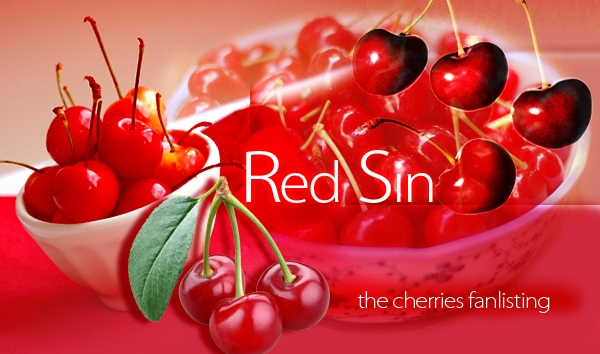 The English word cherry, French cerise, Spanish cereza all come from the Classical Greek (κέρασος) through the Latin cerasum, thus the ancient Roman place name Cerasus, from which the cherry was first exported to Europe. Cherry trees also provide food for the caterpillars of several Lepidoptera. See List of Lepidoptera which feed on Prunus. Layout and contents ©Miriallia do not copy or reproduce. Chibi cherries are by DragoArt.com.